If you’ve ever had chronic severe jaw pain, recurring headaches, migraines or notice that your jaw pops when you move it? If so, you might benefit from neuromuscular dentistry. This treatment places the jaw in its best possible position to relieve pain. This type of pain is part of Temporomandibular Joint Disorder or TMD. It’s a chronic and degenerative disease that can take years to develop. When a dentist provides neuromuscular dentistry, it can realign your bite and resolve the TMD/TMJ symptoms and the cause of the pain. State of the art technology allows the dentist to determine if the symptoms are caused by malocclusion and how to position your jaw so that you don’t have as much pain. Giving your jaw time to heal. That means no chewing gum, biting nails or hard, crunchy food. A mouth piece or night guard are used to protect your teeth and reduce the negative effects of grinding your teeth. Pain and inflammation medications can be prescribed as well as muscle relaxants. Applying moist heat can help ease sore jaw muscles. You might be assigned exercises and physical therapy to help relax your muscles and make your joints more flexible. 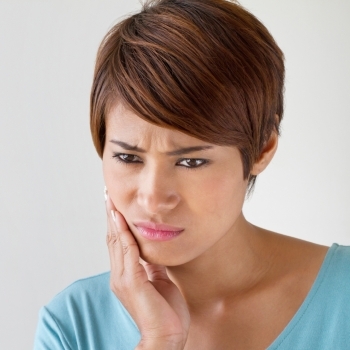 If you have any of these symptom and would like to learn more about TMD-related pain and treatment, call the neuromuscular dentistry professionals at Dental Touch Associates today to schedule your appointment. It’s time to take away the constant pain!